О книге "Autodesk 3ds Max 2014 Bible"
A complete reference covering the newest version of 3ds Max software Autodesk 3ds Max is the popular 3D modeling, animation, rendering, and compositing software preferred by game developers and graphic designers in film and television. This comprehensive reference not only introduces beginners to this pricey and complex software, but also serves as a reference for experienced users. Packed with expert advice from popular author Kelly Murdock, it begins with a Quick Start tutorial to get you up and running, then continues with more than 150 step-by-step tutorials, advanced coverage, and plenty of tips and timesavers. 3ds Max is professional modeling and animation software used in the film, television, and game development industries; this complete guide gets beginners started and teaches experienced users how to take advantage of the program's newest capabilities Covers all the basics as well as advanced topics including crowd simulation, particle systems, rigid body dynamics, state sets, compositing, radiosity, network rendering, and MAXScript Features more than 150 step-by-step tutorials and complete references detailing all primitives, modifiers, materials, maps, and controllers Companion website includes examples from the book, unique models and textures that you can customize, before-and-after examples from the tutorials, and bonus Quick Starts from previous editions Autodesk 3ds Max 2014 Bible is the one book you need to succeed with this all-new version of 3ds Max. 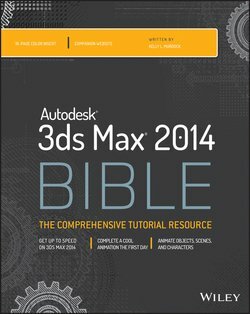 На нашем сайте можно скачать книгу "Autodesk 3ds Max 2014 Bible" в формате fb2, rtf, epub, pdf, txt или читать онлайн. Здесь так же можно перед прочтением обратиться к отзывам читателей, уже знакомых с книгой, и узнать их мнение. В интернет-магазине нашего партнера вы можете купить и прочитать книгу в бумажном варианте.